Time of Origin: The Paternoster Gang regularly operate in Victorian London; Vastra’s precise time of birth is unspecified apart from Earth’s distant past, but Strax apparently came from the future. Appearances: "A Good Man Goes to War", "The Snowmen", "The Crimson Horror", "The Name of The Doctor", Deep Breath" and "Silhouette"
Doctors: Eleventh Doctor, Twelfth Doctor; the gang may have encountered earlier Doctors in their individual encounters. Companions: Amy Pond, Rory Williams, River Song, Clara Oswald; unknown if the gang members also met other companions in previous meetings with The Doctor. History: Although the precise details of their first meetings with The Doctor are unknown, the Paternoster Gang have become some of The Doctor's most reliable allies when dealing with strange phenomenon, dedicating themselves to protecting Victorian London from problems that conventional agencies would be incapable of handing with only superior knowledge and individual advantages rather than access to advanced technology. The most significant detail about this group is that two of the gang's three members are actually reformed enemies of The Doctor; Vastra is a Silurian and Strax is a Sontaran, both races that have often threatened Earth in the past, even if The Doctor has often tried to establish peace between humanity and the Silurians due to their mutual ties to Earth ("Doctor Who and the Silurians"). The precise circumstances of The Doctor's first encounters with each member of the gang are unknown, but according to available information, Vastra was awakened in the human era when workers were attempting to dig an extension of the London Underground, slaughtering at least five commuters before The Doctor managed to convince her not to give in to her rage. Jenny was apparently originally a match-girl before she met The Doctor and Vastra, isolated from her peers due to her 'preference' for women as romantic partners, with this first meeting involving The Doctor saving Jenny's life and Jenny and Vastra falling in love. The precise details are unknown, but Vastra and Jenny eventually set themselves up as investigators in Victorian London, with Vastra developing a reputation as the 'Veiled Detective' and Jenny acting as Vastra's maid for visitors even though the two describe themselves as married (Considering their unconventional relationship, the standards of the time, and Vastra's distinct appearance, it is most likely that The Doctor performed a ceremony for them). Some sources suggest that Vastra's cases were Arthur Conan Doyle's inspiration for Sherlock Holmes - with Vastra as Holmes and Jenny as Watson - ("The Snowmen") but since Sherlock Holmes has been established as a real character in The Doctor's world ("All-Consuming Fire" and "Happy Endings") and only Walter Simeon made this reference directly, it is more likely that Simeon made a mistake and Holmes and Vastra's careers have simply become confused by some external observers, due to such details as both using 'Irregulars' as street contacts to find missing witnesses or suspects, or both working with Inspector Gregson of Scotland Yard ("Deep Breath"). 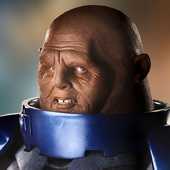 Strax, on the other hand, was a Sontaran who was 'sentenced' to work as a battlefield nurse to restore the honour of his clone batch after some prior encounter with The Doctor saw his platoon fail in an invasion of Earth. Strax, Vastra and Jenny first came together when the Eleventh Doctor recruited the three of them as part of his makeshift 'army' to mount an assault on the asteroid fortress of Demon's Run to rescue his abducted companion Amy Pond from the forces of The Silence ("A Good Man Goes to War"), a religious order that sought his death. Although he was killed in the final battle of Demon's Run, Strax was restored to life by Vastra and Jenny - although they claimed that he had just fainted - who offered him a new chance at life acting as their butler and enforcer (Although his new self apparently lacked some of his old medical knowledge, such as often confusing human genders to the point that he mistook The Doctor's companion Clara Oswald for a boy on more than one occasion ("The Snowmen")). When The Doctor decided to 'retire' from saving the universe after the loss of Amy and Rory ("The Angels Take Manhattan"), he settled down in the Victorian era, remaining in isolation on a frozen cloud in the sky where he resided in the TARDIS and only occasionally coming down to wander the streets, with Vastra, Jenny and Strax assisting him despite their disapproval of his current apathy. When their investigation into the mysterious Walter Simeon and a threat to The Doctor's new friend Clara inspired The Doctor back into action, Vastra in particular clearly approved of The Doctor's return to his usual methods, Strax doing his best to keep Clara alive after she fell from the TARDIS during a fight with an ice governess created by Simeon and his non-corporeal ally (Later identified as The Doctor's past/future foe the Great Intelligence ("The Abominable Snowmen")). Although this confrontation with Simeon resulted in Clara's death as Simeon's ice army was destroyed, The Doctor's interest in travel was restored when he realised that he had met another Clara during his trip to the Dalek Asylum ("Asylum of the Daleks"), prompting him to leave Victorian London and begin his search for her. While Madame Vastra was asked to investigate the mystery of the 'Crimson Horror', where people were found dead in the river with red skin and virtually frozen stiff, the gang discovered that The Doctor was somehow involved when the body of one of the victims had an image of The Doctor imprinted on the retina ("The Crimson Horror"). Determining a connection to a new estate known as 'Sweetville', Jenny infiltrated the estate as a prospective new member, where she was able to rescue The Doctor and his new companion, another iteration of Clara Oswald (Although The Doctor was able to prevent the Gang from mentioning their meeting with the Victorian Clara). Having rescued The Doctor and Clara, the five were able to determine that Sweetville's owner, Mrs Gillyflower, was intending to release a toxin that would destroy all but those she had 'preserved' to restart the human race, aided by 'Mr Sweet', a parasite from Vastra's era known as the Crimson Horror. 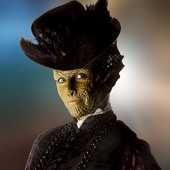 After Strax destroyed the rocket that would have launched the toxin while Vastra and The Doctor destroyed the toxin itself, Mrs Gillyflower was killed when she fell off the rocket's tower during a fight, with Mr Sweet being killed by Mrs Gillyflower's daughter Ada, who had been rendered blind by her mother's earlier experiments with the toxin. After serial killer Clarence DeMarco was arrested, he arranged for a meeting with Vastra to ask her to help get him out of prison, claiming that he had somehow discovered a plan involving The Doctor's greatest secret through his encounter with the mysterious 'Whisper-Men' ("The Name of The Doctor"). Arranging a telepathic conference with River Song ("Silence in the Library/Forest of the Dead") and Clara to discuss this revelation, the gang realised that their unknown enemy was travelling to a particular set of space-time coordinates, but the gang were attacked and abducted while they were unconscious, forcing Clara to share the coordinates with The Doctorâ¦ who realised that they were the coordinates to his future grave on the planet Trenzalore. Despite his grave being the one place no time-traveller should go to, The Doctor felt obligated to save Vastra, Jenny and Strax after all that they had done for him during his 'retirement', taking the TARDIS to Trenzaloe and witnessing his tomb; the TARDIS, grown to an enormous size as the link between the interior and exterior dimensions began to break down, amid a mass graveyard of The Doctor's last battle. Finally reaching the tomb, the five learned that their enemy was the Great Intelligence, now manifesting a physical form via the Whispermen, with the Intelligence seeking to enter The Doctor's tomb so that he could access the 'scar tissue' that was all that was left of The Doctor, tracing his history across the universe. Entering the scar tissue, the Intelligence vowed that he would unmake The Doctor's history and turn his victories into defeats, resulting in Jenny vanishing as The Doctor was no longer there to save her life and Strax reverted to a typical Sontaran mindset, forcing Vastra to kill him in self-defence. As entire stars began to die without The Doctor there to save them, Clara entered The Doctor's timestream after the Intelligence to negate his attack, restoring Jenny and Strax to life as history returned to normal before The Doctor entered his own timestream to rescue her. Following The Doctor's regenerations being restored by the Time Lords as they changed history during the final battle of Trenzalore ("The Time of The Doctor"), the Twelfth Doctor and Clara arrived in Victorian London, with Vastra providing the two with somewhere to stay as the new Doctor stabilised after his regeneration cycle finished 'rebooting'. During their time in London, The Doctor and Clara assisted the gang in investigating a recent series of mysterious spontaneous combustions, Vastra also helping Clara realise how she had to accept the older Twelfth Doctor as the same man she knew before. Although The Doctor and Clara were nearly used as 'organ donors' by a ship full of cyborgs harnessing human organs as spare parts ("The Girl in the Fireplace"), after the gang arrived to help Clara fight off the cyborgs, The Doctor was able to defeat the controlling robot, resulting in its destruction and the subsequent deactivation of all its forces ("Deep Breath"). The Twelfth Doctor and Clara were reunited with the gang when the TARDIS detected an energy spike from a post-nuclear power source in London in their era, arriving just as Madame Vastra was investigating the mysterious death of an acquaintance in a locked room and Strax was looking into the death of a friend who had been apparently drained of his life energy. Determining that industrialist Orestes Milton was the likely source of the spike when he used various incorrect terms during a conversation that suggested he was using a translator matrix of some sort - such as Milton using the word 'debrief' which only came into use in the Second World War and recognising the word 'origami' when it was only known in Japan so far - The Doctor discovered that Milton was an alien arms dealer being hunted by the Shadow Proclamation after his experiments turned people into weapons, attempting to harness and release London's anger on the population so that they would destroy themselves. This plan was thwarted when the TARDIS crew and the gang were able to free Milton's human weapons from his control, with his cloud of anger being negated by a man who could manipulate emotions releasing a wave of positive energy from a carnival show organised by The Doctor and Strax. Milton was subsequently tricked into leaving Earth by one of his other 'weapons', a shape-shifter who posed as a senior member of the Shadow Proclamation to claim that Milton would be pardoned for his crimes if he shared his technology with them, the third weapon's low-level telekinesis proving enough to distract Milton before he could evade the missiles fired at him after his ship left orbit. 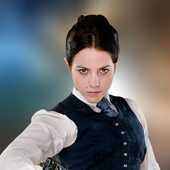 While the Paternoster Gang's methods are sometimes more violent than The Doctor would prefer, they are undeniably effective, and each have come to rely on their skills when circumstances require them to work together, even if Vastra and Jenny both acknowledge that The Doctor is far better equipped to handle some problems than they are.